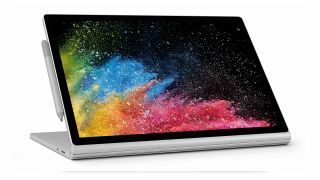 Microsoft has introduced a new entry-level Surface Book 2 to the UK (and some other European territories) which is priced far more affordably than previous models, being pitched at £1,149. Of course, 'affordable' is a relative term when it comes to the high-end Surface Book range, but that price is a good deal cheaper than the previous entry-level model, which commanded an asking price of £1,499. The only difference between this new cheaper base model and the previous one is that it has 128GB of storage instead of 256GB. Otherwise, it’s the same 13.5-inch Surface Book 2 with a Core i5 processor and 8GB of system RAM. Many folks may well consider that losing that storage is a worthwhile sacrifice to make in return for a substantial £350 saving. This is the same move that Microsoft pulled in the US last month, so the UK is just following suit in this respect. France and Germany are also getting this new cheaper Surface Book 2. Microsoft also introduced a new entry-level Surface Laptop in the US last month, which is $200 cheaper than the previous one and drops the processor down to an Intel Core m3-7Y30 (from a Core i5 CPU). We’ve yet to see that model in the UK, but given that this fresh spin on the Surface Book 2 has made its way across the Atlantic we're hopeful that the more affordable Surface Laptop will follow in its wake.